Shown here are the stacker’s dual part-carrying gantries. 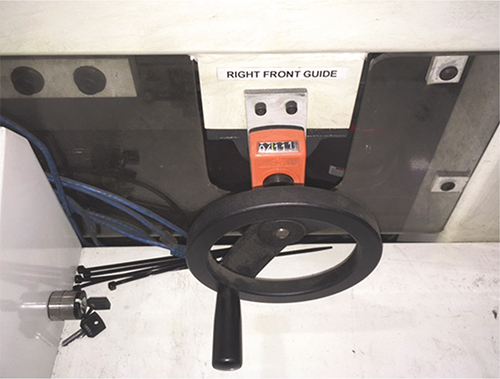 One of the five precision adjusters used for setting part-nesting stops. They help ensure precision stacking of the irregularly shaped blanks. Overall view of the entry conveyors. Shown here is the exit (chain conveyor) for removing two sets of stacked parts simultaneously, and extension arms used to address tailout issues. Blanks are stacked with great precision. 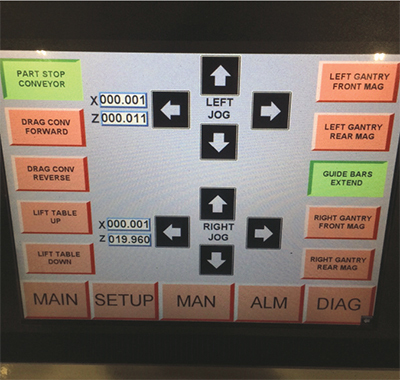 An operator-interface screen enables operators to control each blank stack. 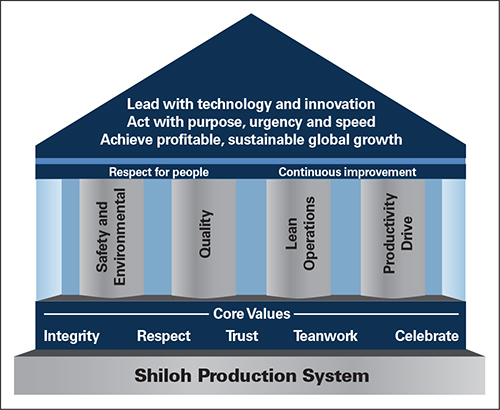 The Shiloh Production System emphasizes cross-functional efforts and continuous improvement. Big jobs bring big challenges. That doesn’t mean, however, that solutions need to be complex. 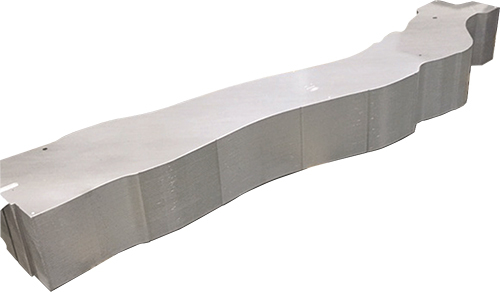 A proof-positive example of this is found at the 81,000-sq.-ft. Shiloh Industries’ factory in Bowling Green, KY, which processes and stacks large, irregularly shaped blanks used in pickup-truck frame rails. Just how large is large? According to Kelly Billingsley, Shiloh manufacturing engineer, the rail parts range in size from 57 to 96 in. long, and weigh from 48 to 89 lb. The material: 80-grade hot-rolled pickled-and-oiled BlankLight blanks by Shiloh that range from 0.200 to 0.280 in. thick. The press, a 3000-ton Danly blanking unit with a feed line, produces a set of left- and right-hand parts with each stroke, at speeds to 20 strokes/min. using a progressive die. At that rate, more than 3500 lb. of parts/min. are processed and stacked. 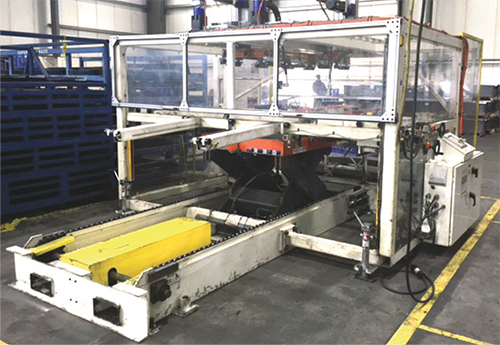 The stacks can be as high as 24 in., and even though the blanks are irregularly shaped, they must be stacked uniformly and with no variation because Magna International, Shiloh’s Tier One stamping customer, places the parts, as shipped, into an automated cell for forming. And, as if multiple-piece sets with irregularly shaped parts isn’t challenging enough, longer blanks exit the blanking press at angles to 45 deg. to maximize material usage, meaning that these parts must be repositioned in order to stack properly. 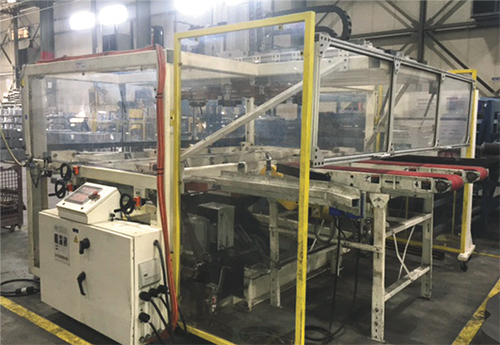 After receiving a quote package from Magna in early 2015 to take on the work, Shiloh set out to find an automated solution. “We sent BMC (Bachuber Manufacturing, Inc.), a provider of press-automation equipment, an RFQ in November 2016, and received and approved BMC’s quote in January of 2017,” says Mike Cousineau, Shiloh’s continuous-improvement manager. “The automated line was implemented soon after. However, Shiloh began processing the parts in 2016, which meant several months of manual unloading and stacking. The end result works like this: Blanks feed from the exit conveyor of the press onto the incoming split conveyor of the stacker, where they are stopped and oriented. The BMC 1401 stacker’s dual 48-in. gantries alternate between picking up both parts with electromagnets, and move them to the parts nests for stacking. The parts nests have adjustable guides to accommodate the different part geometries and enable uniform stacking. Each parts stack is controlled by the operator, who enters the desired number of pieces per stack in the stacker’s human-machine interface. When the stack count is reached, an integral 15,000-lb. lift table lowers the stacks onto an exit conveyor. The stacks then convey out to a position where a forklift moves them to a shipping location. The press remains in continuous operation throughout. 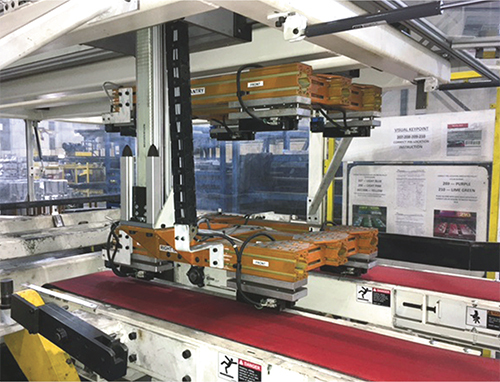 Cross-functional efforts figure prominently into the Shiloh Production System (SPS) continuous-improvement efforts, and this precision stacking system is a prime example of such an effort, says Cousineau, adding that SPS emphasizes safety and environmental, quality, lean operations, and productivity, all of which impact the automated stacking system.